This card is based on the sketch by the super talented Laura at 2 Sketches 4 You. I used my Cricut to cut out the little heart flowers from the Sweethearts cartridge and the Love You sentiment comes from the Lyrical Letters cartridge. 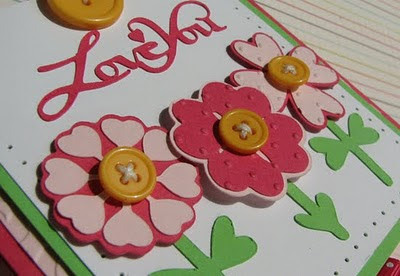 I used the Swiss Dots embossing folder on the flowers for texture and I also used dimensional adhesive on the flowers to give them a little lift off of the card. Carstock, ribbon, Ticket Corner punch, dimensional adhesive: Stampin' Up! Thanks for stopping by and I hope that you have a wonderful day!! What an adorable card! I love all the details! 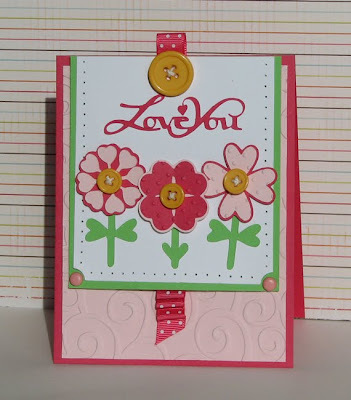 I really LOVE this card....I never think to put my ribbon vertical, always horizontal...I think I am going to try that on my next card...thanks for the inspiration!!! soooooo stinkin cute! Thanks for playing with us! perfectly lovely!! love the embossing! How cute! I love the crispness of the cutting and papers. Great card!